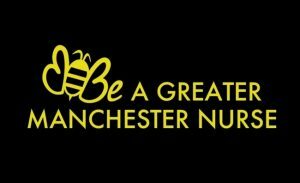 On 29th June, we helped launch the ‘Be a Greater Manchester Nurse’ campaign. We are proud to be part of this initiative led by the Greater Manchester Health and Social Care Partnership. The campaign also includes Manchester Metropolitan University, the universities of Manchester and Bolton and Greater Manchester trusts and care providers. We want to showcase the amazing opportunities available to study to become a nurse in Greater Manchester and celebrate the achievements of an incredible workforce. Central to the overall campaign is the striking “Bee” logo and an inspiring video, “Unsung”. The script for the film comes solely from song lyrics by Manchester musical icons such as Oasis, The Stone Roses, New Order and Elbow. The lyrics are spoken by GM nurses, including our very own students, against a photographic backdrop of nurses doing their jobs.